When an employee is new, and you need him or her to get up-to-speed on all of your organization's policies, use the employee handbook to share the policies. This receipt works for employees to acknowledge receipt of the handbook. This policy receipt acknowledgment is for occasions when you introduce a new policy or change an existing policy and need employees to know. Most frequently supplied during an informational meeting or in-house training session, the policy receipt is filled out under the direction of HR staff at the end of the meeting. You also provide the opportunity for the employees to express any concerns that they may have with the new policy. You have the chance to answer what may well be questions shared by many when you have scheduled employees for the training as a group. Do not let the employees take the policy receipt with them when they leave the meeting. You will spend the next several months chasing down the employees who never turned in the receipt of policy acknowledgment. 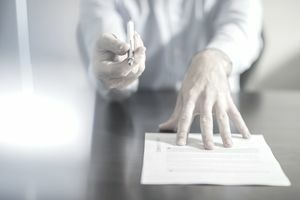 By signing the acknowledgment, the employees affirm that you have communicated the contents of the policy and that they have the information that you wanted them to receive from your communication. It is a core policy for a Human Resources department as it is used whenever a new policy is distributed, and employees are trained on it. Rather than creating a generic example of a policy receipt, you may substitute any policy for the one used in the example below. Following is a sample policy example as it is used for employees to acknowledge their receipt of and understanding of the new dress code. I have read and been informed about the content, requirements, and expectations of the dress code policy for employees at Your Company. I have received a copy of the policy and agree to abide by the policy guidelines as a condition of my employment and my continuing employment at Your Company. I understand that if I have questions, at any time, regarding the dress code policy, I will consult with my immediate supervisor or my Human Resources staff members. Please read the dress code policy carefully to ensure that you understand the policy before signing this document. This sample policy is provided for guidance only. The provided information - policies, procedures, samples, examples, and guidelines - while authoritative, is not guaranteed for accuracy and legality. While I make every effort to provide and link accurate, legal, and complete information, I cannot guarantee it is correct. Please seek legal assistance, or assistance from State, Federal, or International governmental resources, to make certain your legal interpretation and decisions are correct.